Open enrollment for the 2019-20 school year began on January 14, 2019 and will end on February 20, 2019. General Information - What is Open Enrollment? Open enrollment is a procedure to provide your student with the opportunity to apply for admission to the District school of choice and is an option to all students entering the TK through 8th grades. Students residing within the Fullerton School District’s attendance boundaries may apply for enrollment in any District school. You do not need to apply if you wish for your student to attend the school of residence. How do I apply for Open Enrollment? 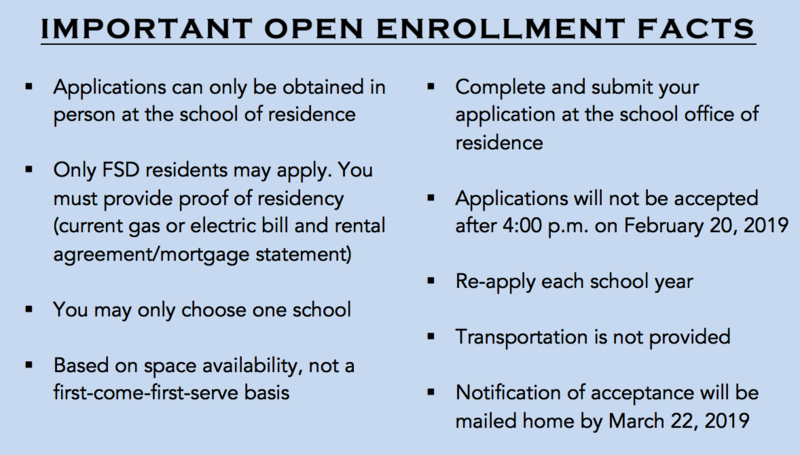 To be considered for open enrollment, applications must be submitted during the designated open enrollment window (January 14, 2019 - February 20, 2019). Applications can be obtained, completed, and returned to the student’s school of residence. All applications must be received by 4:00 p.m. on the February 20, 2019, the last day of Open Enrollment It is the parent/guardian’s responsibility to make sure the application has been received and that they are provided a copy of the completed application. Please note that there are no exceptions!